Hi, my name is Peppy. Aren't I beautiful? I'm a little sad right now because my Mom just passed away....she was my constant companion. I might be timid when you first meet me, but once you gain my trust, I will be totally devoted to you. One of my very favorite things is going for car rides. I'm most content just being by your side all of the time. I hope I can find someone who will be patient with me. And once we get to know each other, I promise to delight you with my sweet and funny personality. I'm 14 years old,11 pounds & I do prefer to be your one & only. Will you be my special someone to adore me for the rest of my life? 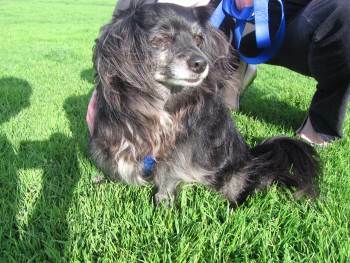 Notes from the Pooch: Many, many people were contacted to help find Peppy a new home. I'd like to thank Chihuahua Rescue of San Diego for standing up for Peppy in her time of need and all of the support from other folks who reached into their address books to find any and every contact that they could to help find Peppy a better life.